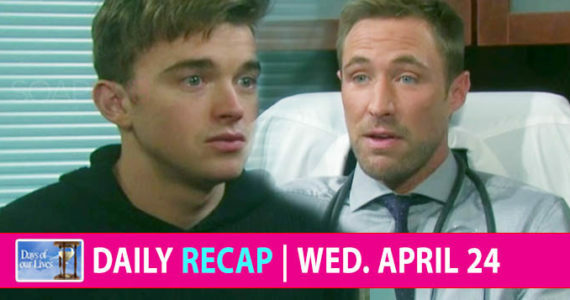 Breaking Days of Our Lives spoilers for Wednesday, November 2 tease progress in the Chloe baby-daddy saga. Pop some popcorn and get ready to enjoy an exciting episode! Nicole (Arianne Zucker) has been operating under the assumption that she had the most updated news when it came to the paternity of her BFF Chloe’s baby daddy. After all, Chloe (Nadia Bjorlin) did confide in her that Deimos (Vincent Irizarry) is the father. Yet, when Philip (John-Paul Lavoisier) shares some stunning news with Nicole, she will be more confused than ever with this incredibly convoluted story. Meanwhile, Deimos tracks down Nancy (Patrika Darbo), demanding information about Chloe. He is a man with a mission, and he won’t rest until it’s completed and he has Chloe (and therefore “his” son) in his custody. Related Just Who Is Valerie On DAYS? Theresa (Jen Lilley) wants to marry the man she loves and raise their son in peace, but with the arrival of the newest Salem bad guy, it doesn’t look like that’s in the cards for her. Could that be why she receives an unexpected visit from her father, Shane (Charles Shaughnessy)? Could he be coming with a warning for her? Jennifer (Melissa Reeves) and Adrienne (Judi Evans) decide to buy The Spectator. This is a return to the past for Jennifer, filled with memories. It was while working for the paper that she shared many adventures with her late husband, Jack (Matthew Ashford). In fact, it is where they met and fell in love. Perhaps she’s looking to feel closer to him, or she just misses the energy she felt while working long hours. Both women certainly need and deserve more to do, so this should get interesting – especially with one of the biggest news stories in town involving Jennifer’s cousin Hope (Kristian Alfonso) confessing to murdering Salem’s most notorious villain. DAYS airs weekdays on NBC. Share your thoughts, leave a comment in the section below. Win exclusive member-only Days of our Lives spoilers, prizes, and more: sign up here!